Former CIAA Player of The Year Drew Powell is now the Indoor Football League MVP. One of the most prolific passers in CIAA football history just added more hardware to his trophy case. 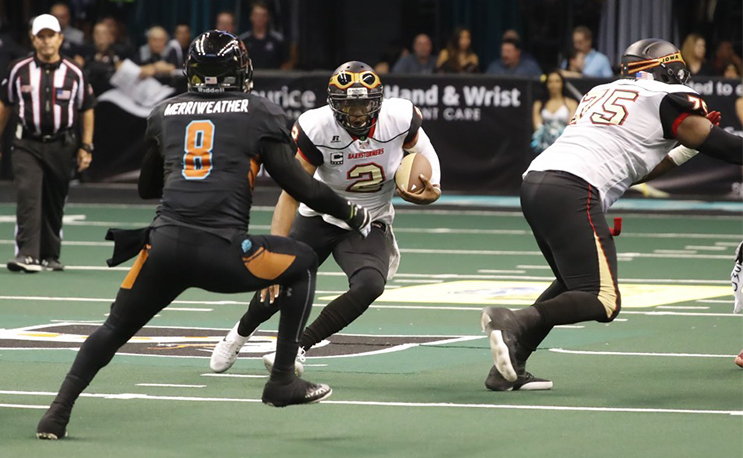 Iowa Barnstormers QB Drew Powell has been named the 2018 IFL Most Valuable Player. In his first season at quarterback for the Barnstormers, Powell led the team to their first playoff victory since 2009 and their first-ever United Bowl appearance. The Barnstormers will face the Sioux Falls Storm on Saturday for the IFL Championship. He also got a shoutout from Hall of Fame quarterback Kurt Warner. Warner played for the Barnstormers before his NFL career took off. Powell finished his season completing 154 of 226 passes for 1,604 yards and 34 touchdowns against just four interceptions. A threat running the ball, Powell rushed for an IFL leading 945 yards and 23 touchdowns. Powell’s 945 single-season rushing yards were second most IFL history. Powell missed two games during the season due to a stint in the CFL, however, he was named IFL Offensive Player of the Week three times this year and topped 90 yards rushing in six games. He was named First Team All-IFL QB following the season. Powell was named the CIAA’s Offensive Player of the Year as a senior in 2015. He had a stellar career at Livingstone in which he set new records with 312 passing attempts, 732 passing completions, and 10,861 total yards.